You run your thumb over his photo on the cover. You expect, just for a second, to feel dips where the holes are printed. But you feel only the rough, high-end paper his photo is printed on. You shouldn’t feel disappointed, but you do. The real photo, the one with real holes from a real staple, is in a library somewhere you’ll never visit. It’s a passport photo, probably. He did travel so often. Lived life the way you want to. Maybe that’s why you read his novels. But you know that’s only part of it. A piece of his signature in black ink. Official looking stamps border his serious face. The face of a man already through a third of his life. And you know where he’s going, but he doesn’t. He’s already seen war. He’s already loved madly. He’s already chosen his calling. Well, of course he’s already done everything he’s ever going to do. But when you look at him in this photo, you feel like maybe that 25-year-old boy still exists somewhere. And a little part of you thinks you might still save him. Because you’re stupid and romantic and you love too much. What would he have said about that? Probably the same. He looks out at you, but you’re the only one who can see here. His mouth, both sensual and serious, is frowning. His eyes sparkle with some mirth under cover. Or it’s that hunger he talked of so often. Or maybe he’s angry. Sometimes it’s tough to tell the difference in men like these. A perfect imperfection in the hairline to the left (his left, your right) will define his face long after his eyes lose that fierce confidence, that unrelenting determination. Even when his face begins to sag and the hair behind that imperfect border turns white, it will define him. You’ll know it’s him. Because of that imperfection. That suit! So conventional you almost laugh. You’d never guess he’s an artist. Strong features. Broad physique. You’d never know he was so sensitive to nuance. To the light changing on the trees. To the subtleties of strangers. All those things he wrote about. How beautiful he is. And despite his clean-cut look, even he would call himself damned. Writing this must have felt like coming full circle. Like seeing the beginning, where it all started. Remembering the hope and realizing you didn’t have it anymore. Achieving your dreams and realizing they didn’t fulfill you. Everything you worked for. Everything you starved for. Now so much paper in a steamer trunk. I imagine you opening that trunk of Paris memories. You finger through notes from The Sun Also Rises, your first great success. Old clothes, no longer in fashion. You’d say you don’t care about fashion. But after “Secret Pleasures,” we know enough to know you are lying. Besides, the clothes wouldn’t fit you anyway. Not anymore. There’d be books. None of Sylvia’s, of course. You were too conscientious of her kindness in lending. But books you bought from the The Tour D’Argent’s valet de chambre on the quai. Where you forgot the patroness’s name, so none of us ever knew it. Maybe there were pictures. Hadley and Bumby. Zelda and Scott and Ezra and Stein. These things mattered to you once enough to store them. But not enough to take them home. Not enough to drag them with you through Africa or Cuba or the States. Through three more wives and two more children. Not the hard copies, anyway. You have these things now only because the men at the Ritz begged you to take them finally, after thirty years in some dusty corner of their hotel basement. And then you were gone. You died in the middle of writing this book. What made you clean the gun that spring morning? And, spring, your favorite season. Your happy, hope-filled season. Was it something in the steamer? Was it something in the stories you told? They said it was an accident. And, you, the expert hunter. Whatever it was, H, you can’t know us now. But we know you. Wow, so beautifully written. One I know Mr.Hemingway would have considered one of his finest love letters. Thanks, Dan. I guess it is a kind of love letter. 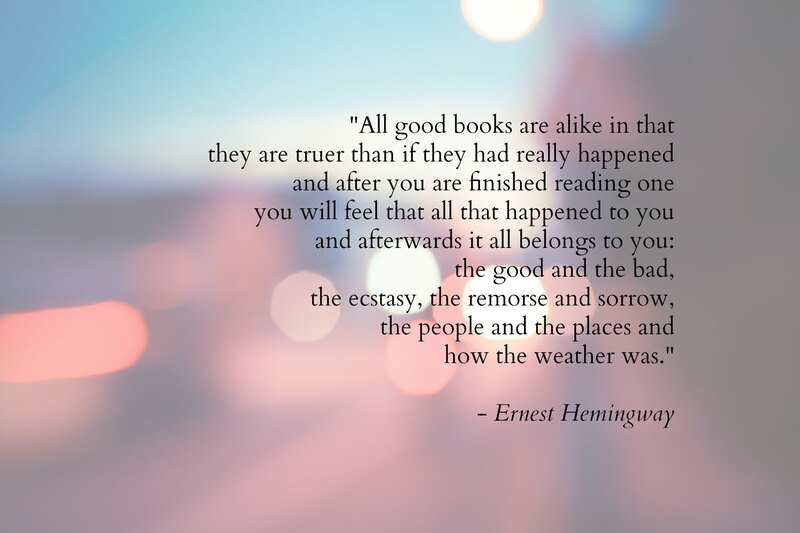 I am not a Hemingway fan…but this was a lovely tribute…makes me want to give him another go if only for hope I’d find some of what you have found in his words. I recommend A Moveable Feast for a starter, if you give him a try. Very approachable. Plus, it’s just a series of vignettes from his early years in Paris, so you can pick it up and put it down without losing the thread of things. “Even when his face begins to sag and the hair behind that imperfect border turns white, it will define him. You’ll know it’s him. Because of that imperfection.” This line and everything else in this post was so beautifully written. I absolutely loved reading this. Thank you, Jasmine. That means a lot. This was my favorite thing to write and share on the blog so far, so I’m glad you enjoyed it too. Such a wonderful and beutiful story. Thank you for writing such a lovely piece. 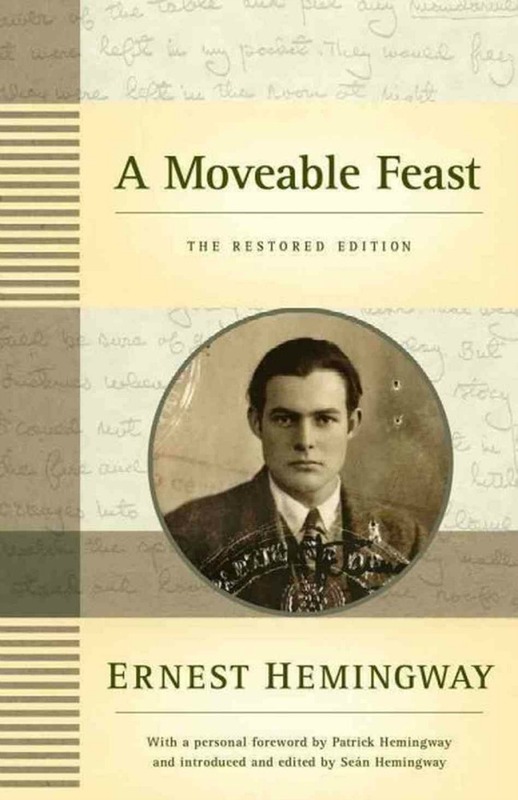 I enjoyed Hemingway’s novels, but it was not until I read “A Moveable Feast” that I felt I had any insight into who he was. Beautifully written, Mandy. I enjoyed the point of view you took. 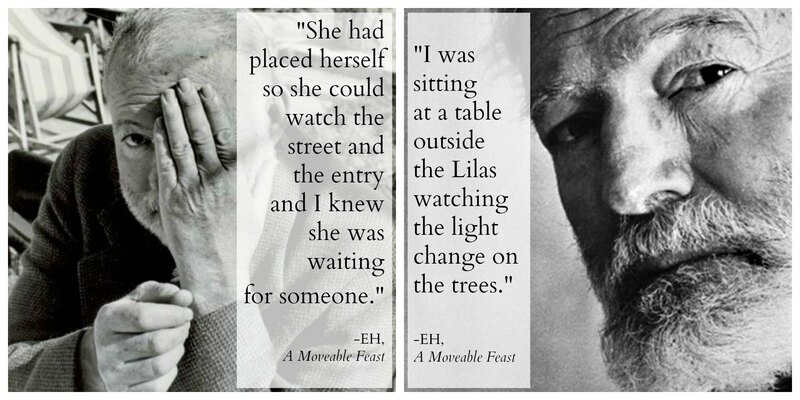 My book group assignment one year was that we could each read one of EH’s books. 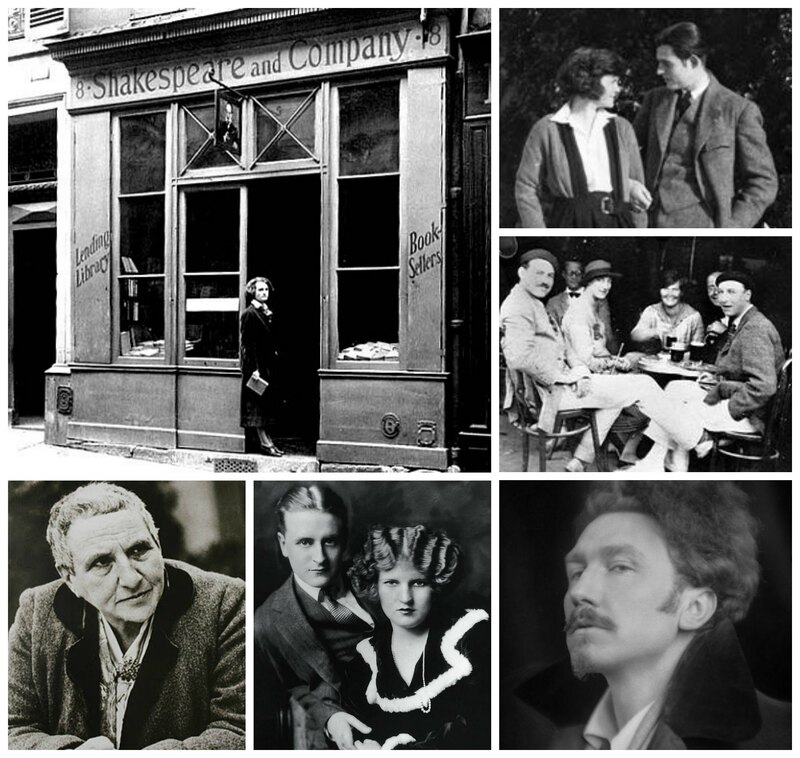 One of the folks did tell about A Moveable Feast. Looks like I will have to pick that one up. I think you wrote a great article. However, I’m still not convinced. I’ve read two Hemingway novels and I just don’t like him. I like his theory of the “iceberg” but I’m not a fan of the way that he accomplishes it in his own stories.